Middlemen and ganja smugglers are luring the farmers into growing the forbidden crop by dangling the bait of high profits. Remote areas in Jogulamba Gadwal district on the banks of the rivers Krishna and Tungabhadra are engaged in a flourishing ganja cultivation business and the middlemen who collect dry ganja from them are supplying it to either Raichur or Hyderabad. Hyderabad: Ganja cultivation is a new lucrative business for farmers. The temple district of Alampur Gadwal, rural areas of Warangal and surrounding localities up to Narayan Khed in Sangareddy district are becoming hubs for the cultivation of ganja. Middlemen and ganja smugglers are luring the farmers into growing the forbidden crop by dangling the bait of high profits. Smugglers from Karnataka, Maharashtra and Hyderabad are even supplying seeds to farmers free of cost! 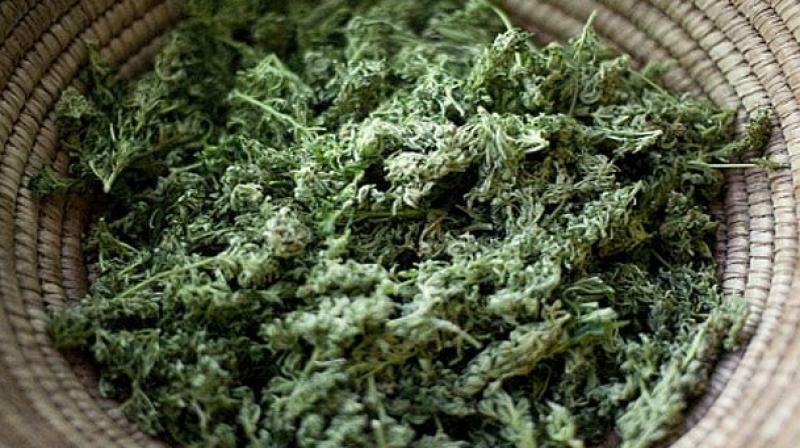 Remote areas in Jogulamba Gadwal district on the banks of the rivers Krishna and Tungabhadra are engaged in a flourishing ganja cultivation business and the middlemen who collect dry ganja from them are supplying it to either Raichur or Hyderabad. The ploy by the farmers is a simple but clever one. They cultivate the forbidden crop in between other crops with similar leaves like cotton, chillies, ‘subabul’ and marigold. Excise and enforcement officials suspect that the farmers from Ayija, Manavapad, Vaddepally, Alampur and Itikyala are cultivating the illegal ganja plant. As are farmers from tribal areas in Narayan Khed assembly segment in the Sangar-eddy district, in the process earning a whopping Rs 75,000 to Rs 1.5 lakh per acre in three months! The ganja is supplied to Maharashtra and Hyderabad. Last year, excise teams destroyed about 1.5 lakh ganja plants in a single raid. The estimation of the stock was more than Rs 2 crore.